Mykonos is as cosmopolitan at table as everywhere else, but it also holds firmly to traditional island fare. The variety of choice is increasing all the time, as new all-day restaurants spring up on the beaches and the hotel restaurants improve, while the arrival of the splendid Nobu last year was the most talked about opening in Greece. Most restaurants and tavernas open for the full tourist season, from Easter (or April if Easter is very late) to the end of October or early November. Some tavernas on remote beaches may only open for the three-four months in the summer. 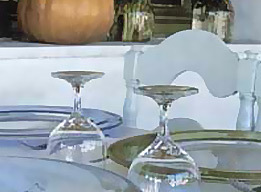 For restaurants, reservations are essential, especially on the weekend or during the high season. 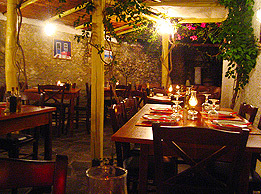 In Hora, the restaurants and tavernas usually only open in the evening. While on the beaches are usually open for lunch and dishes. The prices given are per person and wine is not included. The cost is based on the average cost of a starter, an entree and a desert. 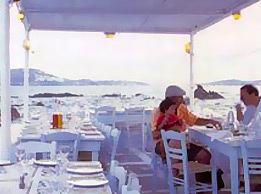 During the 1970's the tourist development of Mykonos began. 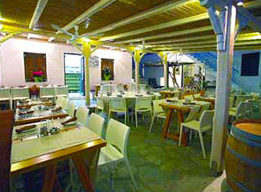 At that time Philippis Kontizas opened the "Philippi" Restaurant, one of the first restaurants that opened to serve the constantly increasing number of tourists.Inspiration for this restaurant, which Philippi opened in 1974 in a garden at the heart of Mykonos town, has been the family's old vegetable garden and the love for tradition. His mother, a traditional Mykonian cook stood by him along with numerous Mykonian recipes. Today, it holds a place among the 250 best restaurants in the world in the same spirit of hospitality and quality. 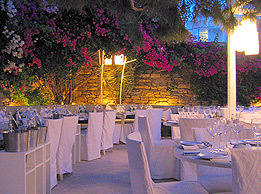 In the beautiful garden or the indoor dining area one can enjoy their drink or taste Greek and International cuisine and, of course, Mykonian dishes. Yet another "branch" of a trendy Athenian restaurant. The courtyard of this old Mykonos mansion, with the enormous palm trees and the elegant white decor, justly deserves the title of the most beautiful garden on the island. The food is simple and quite good. The summer haunt of the popular Interni in Athens, in a courtyard dressed in Cycladic white, white trendy touched from Paola Navone. 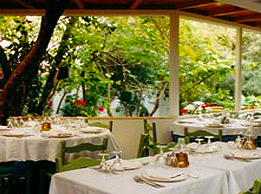 The avant-garde fusion cuisine of the new Dutch chef Rudolf van Nunnen, with its artistic technique and lever combination of ingredients from the East and West, has turned Interni into the island's top restaurant in Greece according to the 2003 Golden Hat awards. Do try the wonderful cod with the chicoree, leek and mustard sauce, and the stir-fried seafood with noodles. Efficient service with long wine list. Another plus for this restaurant is its soundtrack and the bar that quickly became a meeting place for the high society. 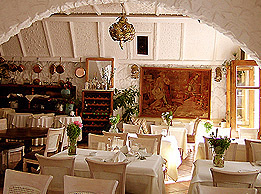 The oldest chic restaurant in Mykonos. Tables perched on a wide stone wall, in a small alley vertical to Matoyanni Street. Its cuisine, untouched by the passage of time, moves between Greek traditional (home-style appetizers, for example) and international luxury. It is famous for its excellent quality of its raw ingredients (exquisite filets and salads) and its pricey menu also. Located on the sidewalk, a major asset, as you will see and be seen by the whole of the island. 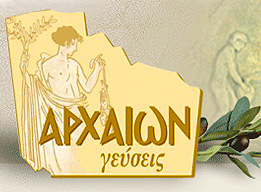 Its grand opening in summer 2004 and the evenit of the season in Greek islands! One of the most famous restaurants in the world has come to Mykonos, replacing the -already successful- Belvedere Sushi, For its opening Nobu of Mykonos was run by a team from Nobu of London (backed by the excellent staff of the Belvedere Hotel), and its superb quality earned it one of the tops pots in the 2004 Golden Hats. Nobu's cuisine is based on Japanese tradition with trans-Pacific fusion of influences from Latin America. You won't want to miss dishes of such utter perfection as the black codfish with sweet miso or the yellowtail sashimi with jalapeno peppers, or the amazing sushi. The restaurant also rates high for its excellent location, with a panoramic view on Hora, its exemplary service and its well-designed and very extensive wine list. 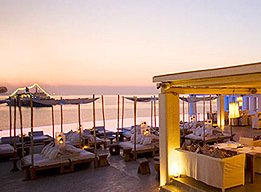 The most trendy restaurant in Mykonos for at least the last four years . Strategicakky placed bellow the Windmills facing the sunset and the Little Venice, the Sea Satin sets out its tables and counters with the fish and local vegetables as if it were a street market. Eveytghing reminds you of holidays, while the service is very fast and there is a "bar" mood. Excellent cooked vegetables, perfect French fries, very fresh sea food, fresh fish and juicy T-bone steak cooked on charcoal. After midnight, the volume of the Greek music goes up and the party really gets going. A lush green garden with giant bougainvilleas, a cool, peacedul oasis, amidst the hustle and bustle of Hora. A cuisine with a Mediterranean influence, and some exotic touches, like the excellent spicy chutney with ginger, that accompanied a beautiful cooked camembert. One of its main assets is the careful preparation of all dishes. 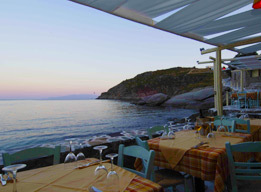 One of the island's classic Greek restaurants, superbly situated in Tria Pigadia. Savour classic Greek cooked dishes and fresh fish as you watch the world go by. A terraced courtyard with references to Ancient Greece in its decor. The menu suggestions are very interesting and tasty, and definitely based on Ancient Greek cuisine. The whole climate, from the waiters to the plates, try to bring us closer to the way our ancestors used to eat. This is also the only place you can find the ANCIENT NEWS, a newspaper which publish the menu of the restaurant in Ancient Greek to English. There are two sister restaurants in Athens and one in Dusseldorf, Germany. 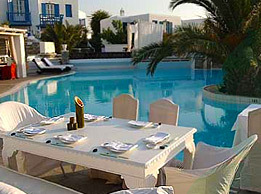 The hotel restaurant of the hotel Tharroe of Mykonos has a patio with a breathtaking view of the whole Hora. In poor weather you can sit outdoors, in an atmospheric room with an astonishing hand-painted gold ceiling. 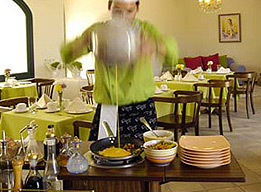 The cuisine is Greek with a Mediterranean flavour, and is based on organic products. The service is exceptional. Aesthetically renovated, the restaurant at the Cavo Tagoo serves an interesting modern Mediterranean cuisine with Greek and Italian touches in an atmospheric poolside setting with a lovely view of the sea. 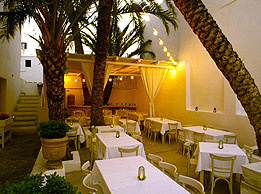 One of the best restaurants in Mykonos, not however of the same level as its twin in Athens. Ivan Otaviani is trying (the municipality is causing him problems however) to open a new, larger Sale & Pepe, in the Kanalia area. 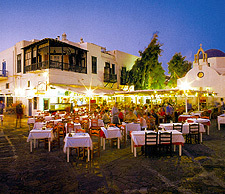 Its narrow veranda is overcrowded with Greek and foreign gourmets, who come in shifts, from 7pm until 1am. The best spaghetti in Mykonos is served there. Try the strozzapretti with gorgonzola and speck, the excellent rissotti, ads well as the very good meats and antipasti. Well-studied wine list, although relatively limited. Satisfactory service, if you consider the "chaos". While you wait. Look around you: everything happens right there, in front of you. A unique restaurant in a recess of the rock, right in the sea. The area where the tables are set in the summer is all covered by water in the winter! You will choose you lobster from the natural pool that communicates with the sea. Italian cuisine based on sea products. 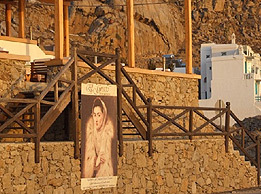 Italian chef Daniele Chiantini has become firmly settled in Mukonos. His elegant restaurant with its cheerful colors was one of the year's real success stories, and this year he is taking his concept one step further, combining simple and very Greek dishes with the polished Mediterranean cuisine. This year's menu includes his very interesting pasta dishes, of course (exclusive collaboration with the famous Pasta Garofalo). Another plus point is the restaurant's fabulous wine list, and Daniele makes daily suggestions based on what he found in the market that morning. Open February to November. The success continues for Dafni, run by Dimitris Pavlopoulos, which is always the avant-garde of the new face of Ano Mera. 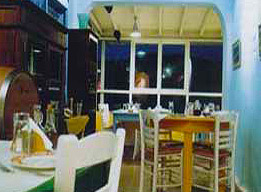 Its design combines the feel of a modern taverna with the comforts of a good-quality restaurant. Its simple, high standard cuisine is based on best ingredients and expertise, with an emphasis on fresh fish. The salad, made with local, steamed vegetables, is out of this world, the French fries exquisite, the local meat perfectly grilled, the fish terribly fresh and the lobster spaghetti is a treat. Don't forget to try the tarte tatin (a kind of apple-pie). A special feature is the ecological wood-fired oven. Dafni acquired an Athens "branch" (Dafni & Chloi) some years ago. Open March through October, lunchtime and evenings. In a beautiful farmland covering 12.000 sq m, Philippis grows numerous vegetables and produces very good "kopanisti", tasty "louza" and rich "xinotyri". You will sample well-prepared Greek dishes and local specialties, like fricassee with beet and "bourantza". On the same farm, there is also space available for receptions. A clean, family-run kebab joint, particularly well looked-after, with tables set outside. Its specialty is, of course, the kebab pita bread or plain, with the "handmade" French fires and chilled beer. A classic, island-style taverna with Greek food. Its specialties include the lamb "kleftiko", the squid stuffed with chesses and the veal in a clay pot with olives, cheeses and fresh cream. The boat-couches, the long bar and the amazing marble bench in front of the grill, provide Ahinei with its unique style. You will enjoy live sweet-smelling sea urchins, shellfish, octopus, and beautifully-grilled vegetables, as well as fresh fish and seafood spaghetti. From the afternoon on, the music often invites you to sing and dance. Open daily from February to October, at lunchtime and in the evenings. Charming little taverna on the isolated Fokos beach operating until last year without electric power. A place created with personal care. You will find a large variety of salads (the vegetables come from their garden behind the shop), fresh, local meat, grilled fish and cooked dishes (one per day, but good), Open only at lunchtime. The super-trendy beach bar-taverna, run by Giorgos Sagklaras, that has made of Panormos one of the most fashionable beaches on the island of Mykonos. The chiose of music and fantastic daiquiri tell only half the story, the other half being its tasty cuisine. Try fried squid, risotto with sea food, delicious meat rissoles with fresh French fires and good pasta.